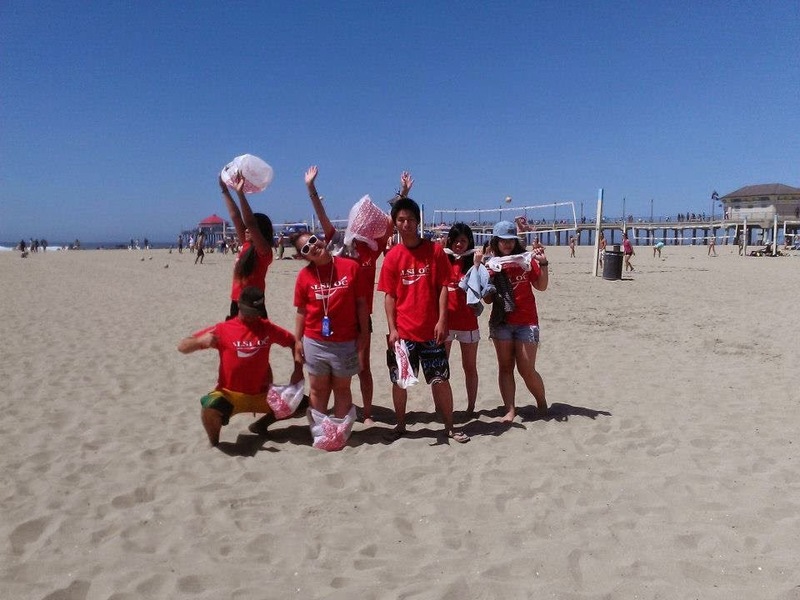 April 22 is International Earth Day, and for the past couple of years, Language Systems - Orange County has celebrated this day by organizing a volunteer opportunity for students called "Beach Cleanup Day." On this day, students and teachers get together in Huntington Beach to collect trash along the beach and to do their part to help keep California clean. The idea for this activity came from the Surfrider Foundation, whose mission is to clean up California beaches. It is really sad to see just how much trash people leave on the beach. In Huntington Beach there are trash cans about every 10-20 yards, yet still many people are just too lazy and self-centered and they do not make the short walk to the trash can. I live in Huntington Beach and I surf there almost every morning, so I see trash scattered all along the shore every morning. It is especially bad in the Summer time and during Spring break. One time there was a large family sitting next to us on the beach, and this little boy unwrapped a candy bar and started to eat it. After he was done with his candy bar, he looked at his father and held up the wrapper as if he were saying, "What do I do with this?" The father took the wrapper from the little boy and just threw it on the beach. The boy gave his father a kind of funny look, and then just shrugged his shoulders like, "Oh, ok. That's what you do with trash at the beach." Please, when you visit any beach in California, don't just throw your own trash away. If you see a piece of trash on the beach, try going out of your way to pick it up and throw it in a trash can, even though it is not "your" trash. You'll be surprised how good it feels to help keep California clean!